If you are a descendant of a Franklin soldier please make sure you visit the FranklinDescendants.wordpress.com to have your loved one’s information submitted to this master web-based resource. My wife is a direct-descendant of Thomas Jefferson Williams (120th Indiana). 1. GEORGE PINKNEY WALLEY… 27TH MISS. INF… BRANTLEYS BRIGADE. i’m a descendant on my mother’s side of pvt.andrew jackson mclaney,co g 1st alabama infantry,who died at the battle of franklin. I’m a decendant on both my Mom’s and Dad’s side of Confederates and Union Soldier’s that fought at Franklin,Brentwood,Thompson’s Station and Spring Hill,etc… at least 30 or so confirmed Confederate McDowell Family members in various Units of Artillery,Calvery,and Infantry, also at least 8 Union Family members , it’s funny the more you dig the more you find and that doesn’t even cover the other Cousin branches like Sawyer, White, Ransom, Cathey, Crowe, Guthrie, Waller, Wall, Kennedy, Hays, Hughes, Tarkington, Read, Reed, Griggs, McGavock, McClure, McFadden,Goodrich,etc…Since my family settled in and around Brentwood, Franklin, Columbia, and Nashville the Historic Roots run deep,I’m really enjoying all the blog here and hope to see much more saved,and discovered….Bully! to the BFPS,and all involved keep up all the good work, don’t forget everyone to let your family’s History be known. Im a descendant of Von Hilburn– my great-grandfather who was wounded and captured at the battle of Franklin. He was from Alabama. My Husband’s great grandfather was the brother of Andrew Jackson McLaney. We have a letter written to his brother (henry George McLaney) about the tombstone. Please contact me. morganvmerrill@gmail.com. I’d love to see a copy of the letter regarding the tombstone of A.J. Laney. All of the following comments are taken from the Facebook group page. Having had six ancestors who fought in the Battle of Franklin, I will always remember the date November 30, 1864. Pvt. Abraham Howell(24), Co. A (Red Rovers) 5th Mis’sippi. Out of (17) in his Co. He and one other man were the only ones not killed or captured. After the battle of Nashville He went back to his home in Monroe County Mis’sippi. My Great Great Grandfather Sgt. John Crooks served in Co. “I” 51st Ohio Vol Inf. along with his brother Private Henry Crooks who was detached to the Ambulance Corps during the Battle of Franklin. My Great Great Great Grandmother’s cousin Jacob Francis was in the 97th Ohio Vol Inf. at the Battle of Franklin. My great-great grandfather was Moses Merrideth Burt. 52nd Georgia. Family stories say he was an ambulance driver. I imagine he was very busy after battle. i’m a descendant on my mother’s side of pvt.andrew jackson mclaney,1st alabama infantry,co g,who died at the battle of franklin. Well even though my uncle was a darned yankee, Pvt. Joseph Regnier 37th Illinois, I had one grandfather who we speculate was with Quantrill or in the Missouri Infantry. My 3rd Great Grandfather, Pvt. Jerome Bonapart Dooley,40th Indiana. Fourth Army Corps, Second Div. [Wagner], 2nd Brigade [Lane] His pension records state he was wounded there. As an author, I going to start compiling info on the 120th and write a unit history. would love to hear from all descendants of the 120th! My ancestor,1st Sgt. William W. Taylor 31st Tennessee Inf., Company E (Strahl’s Brigade), later captured at battle of Nashville. My wife’s ancestor, Pvt. John Carpenter, 120th Indiana, Company K.
Small world! We have copies of his service record and pension paperwork. He was present at the battle of Franklin. The only funny notation was in March and April of ’65; “Stoppage of pay for one bayonet and one waist belt.” He must have lost them marching through North Carolina. He was charged $2.40 for the loss. I think my ancestor Robert Bacot of Pike County, Mississippi may have been there with N. B. Forrest, but am not sure. He was not killed in the war, but was with Forrest for several years, including 1864. If I can find any details, will send them to you. My others from Miss. were with R. E. Lee’s army. Am pretty sure at least one of my relatives was there because he was with Forrest in 1864. Will do some research if I can find any, and send it to you. Have been meaning to do that for many years anyway. He was not killed in the war. If he had been, I would not be here today, because he was not married until after the war. My G-G Granduncle, Pvt William Thomas Gamel, Co. C, 30th Georgia Infantry. My great, great grandfather, Benjamin Harrell fought in the 20th Mississippi Infantry and participated in this battle as a 16 year old boy. My 3xgrandfather James R. Humphries rode in a unit with Ole Bedford Forrest…the Wizzard in the Saddle. He was a part of the Consolidated 10th/11th Tn Cavalry. He surrendered with Forrest in Selma and the stinkin’ Yanks made him walk all the way back to nashville with his brother…horseless and gunless….Yello-belly Yanks! my gggreat uncle was Capt. George W. Holtzclaw, Company F 16th South Carolina. He survived the Battle of Franklin, was wounded at the Battle of Nashville but survived the war. His brothers grandson is in his 90’s and still living and working at his antique store in Charleston SC. yes, I am 95% sure my uncle Joseph Regnier, who was with the 37th Illinois fought there. Thats what it says on his papers I looked up on Civil War Soldier Search. I am descended from Dempsey John Corbitt (Corbett), 55th Brown’s Tn. Inf. He was killed in the Battle of Franklin and is buried at McGavock Cemetery. I have the genealogy written down, but have not turned it in yet. GG Grandpa Pvt. Whitfield Monroe Parker 63rd VA Inf., guarded ordinance during the battle then on clean-up duty on Dec 1. GG Grandpa Farrier James Patterson Cockerham 10th TN US Cav was at Wilson’s headquaters, Williams farm near present-day 96-Mack Hatcher intersection. Skirmished with Forrest early on the 30th. I am a direct descendant of Dr. Joseph Franklin Smith who was killed during the Battle of Franklin, TN. I am his great, great granddaughter. His brother Andrew Gill was there too, but survived. Will dig up my info and send it to ya two on the confederate side and 1 on the union side .. the fed was across the river and saw no action. I had two great grandfathers who fought at Franklin, both on opposite sides. Had ancestors there and the Confederate impression of my reenacting unit was part of Jackson’s Division which helped punch the hole in the federal line near the Carter House ( 2nd Battalion Georgia Sharpshooters ). I’m an indirect descendant of Todd Carter and the Carter Family. I can remember Dr. Rosalie Carter used to visit her alot when I was a kid. An uncle, Pvt Elliott H Crook, and a cousin, Pvt Wiley M Crook, Co.I, 13th Tenn Inf, CSA at Franklin. Wiley captured the flag of the 52nd Indiana Inf. My GG Grandfather Emanuel Cisero Waters fought in Bate’s Division, Jackson’s Brigade, 1st Georgia Confederate Regiment, 2nd Co. H at Franklin. My great grandfather, Pvt. Nathan Richardson (“NR”) Oakes fought in the Battle of Franklin in Cleburne’s Division, Lowrey’s Brigade, 32nd Regiment, Co. D. If fact, he published a couple of short letters in the Confederate Veteran. One in the Vol. VII (Sept., 1899) issue, he wrote about a comrade he saw fall “on top of the breastworks to the left of the pike leading from Columbia into the town.” He enlisted in Corinth in March 1841, and surrendered at Durham Station on April 26, 1865. Weeks after the war, back in Mississippi, he married the sister of another of his comrades, my great uncle, Sgt. William Turner, of the same company. My Great-Grandfather, George E. Dorrill, was in Company E of the 5th Mississippi at Franklin, Tennessee. It was also in General Mark Perin Lowery’s Brigade. He was known as “the Fighting Preacher. After the war, he founded Blue Mountain College for females, at Ripley. He was also president of the Mississippi Baptist Convention for ten years. Thanks for your post. I was unaware of the dissertation. I’ve come to admire Lowrey. Is there very much info in the paper about the 32nd? Would it be possible to get a copy? Do you have a copy of that Lowrey dissertation you could share? How might I obtain a copy? Col. William Wallace Witherspoon, was my great, great, great, uncle and he was killed at the Battle of Franklin. (36th Mississippi). If anyone has any info about him or his involvement here, I would love to gather all the info I could. Section 48 , Mississippi Section, in grave Number 391. He is listed as Col. William W. Witherspoon of the 36th MS in Sears Brigade. My great, great uncle Pvt. Samuel Thomas Walker of the 49th Tenn Inf. Co D. was captured at Franklin. He was Pull over the breast works as recorded in his pension papers, by his Capt. John M. Nesbitt. He was made a prisoner and sent to Louisville then to Camp Douglas which was his second visit to the place. He was held till after the war. My great, great grandfather Pvt. Phillip Henry Deason he also had a stay at Camp Douglas and was with The 49th Tenn Inf Co. B also fought at Franklin and was later captured at Nashville. Pvt Philip Henry Deason was my great-grandfather, his son John Sidney Deason Sr. was my grandfather, his son John Sidney Deason Jr was my father. P.H. 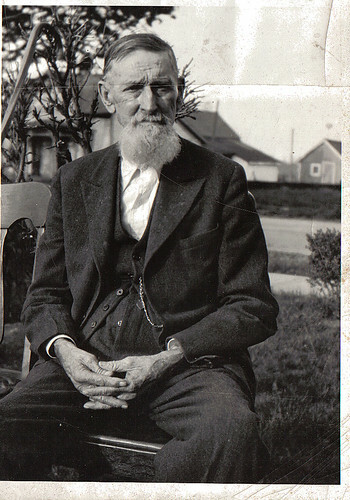 Deason is also my great-grandfather. His daughter, Noma, was my grandmother, and my father was Butte Hamilton. I have a photo of P.H. if you would like it. He served in the 49th TN Infantry Regiment, organized 12/24/1861; captured at Fort Donelson, paroled at Vicksburg; reorganized Sept 1862. He enlisted 11/29/1861 at Charlotte, TN for one year, was assigned to Lt Col Thomas K. Grisby, Rbt H. McClelland, Co “b” with other men from Dickson Cty. He was captured 2/16/1862. Is it the picture of him with a dog? Do you know the Road or old home place where Philip lived? We are distant cousins . Pvt. Philip Henry Deason is my third great grandfather. His daughter, Agnes was my great grandmother, Hazel Aline’s, mother. Hazel’s daughter, Helen is my grandmother and her daughter,Judy is my mother. my greatgrandfather C.W. McCain 4th Miss. was wounded at Franklin but he remained on line . He also was at basttle of nashville. His brother James captured battle of Nashville died at camp morton. C.W. escaped to Tupelo, Miss. for winter. C.W. Was in many battles in Miss.,Tenn. & Ala. His brothers also included Robert W. 4th inf.,William E. 4th inf. Issac 29th Co.A. Dont have much history on the brothers. I just finished The widow of the South and love to read about C.W. Battles. Co. E: Crosbys (5), William T. Hossey, Miley (2), Ulmer, A.J. I also have other relative whom were in the 40th Mississippi Infantry – Atwoods, Mileys, Palmers, and Ulmers. I am sure there are probably more I can add to my list. William was my father’s uncle (my great grandfather, John Bates, is also William’s father.) There has much confusion on my part at the William Bate and William Bates, but from dates of birth they are not the same, however they may be related. Benjamin F. Birdwell of the Tennessee 28th Infantry was my great great grandfather and he lost his left arm up to his elbow at Franklin. He was captured by the Union and then sent to Camp Chase near Columbus, Ohio. Ben’s obituary quotes him as saying the injury did not stop him from doing anything but tying his shoes. There is a supposed picture of him available on the internet and I have visited his gravesite at Flynn’s Creek near Gainesboro, TN. The cemetery is difficult to reach since it is down a steep holler and is almost completely covered over with weeds and such. I sometimes wonder what it would take to move him and his wife,from the site. Anyone have any advice? My grandmother told me her mother feared that Ben would be forgotten. I appreciate the opportunity to post his name on this site and Kraig’s interest in the Battle of Franklin. My great great grandfather James Wilson Speck was in the 31st Mississippi Co. K. He died around 1930 in Oklahoma and is buried in a little cemetery at the top of hill in the middle of a farm field. My great-great-uncle Francis Marion Eddins, 17th Alabama Co H fought and died at Franklin and is buried at McGavock. He had 2 brothers were also in the 17th, they were captured at the Battle of Atlanta and sent to Camp Douglas in late July 1864. Another, younger brother, my g-g-grandfather may have been with them, but we cannot find any records yet. Just hearing from others who have relatives that fought on either side somehow makes me feel more connected with Francis; knowing he won’t be forgotten. I am researching where he actually fell, he was with Stewarts Corp/Canteys Brigade. My great grandfather, Sgt. William John Martin, 26th Alabama, was at the Battles of Nashville/Franklin. He was captured, but escaped. My g-g-g-g-grandfather Edward Nix son John Edward Nix Private Company C 33 Infantry Alabama is buried at McGavock Cemetery. Stroy has it that Edward Nix lost his life in a train werck in Cleveland, TN. The family had not heard from John and his father enlisted and was enroute to locate him when the accident occured 4 Nov 1862. My great great grandfather, Reuben J Stone, Tennessee 23 rd, later consolidated to 17th was wounded through arm by minie ball. He was captured. Arm amputated in Nashville. He ended up prisoner in Point Lookout, Maryland until end of war. I have documentation from National Archives on him and his record. My great great grandfather also ended up at point lookout,md. Robert S.Dooley he was captured at Franklin and sent to camp chase and the point lookout. He was with Co.E 30th Mississippi infantry. My G.G. grandfather pvt William P. Grayson 34th infantry division Tennessee Volunteers I beleive under Johnson was wounded and captured at the battle of Franklin and spent the rest of the war in Davis prison camp in Illinois. I would like to find out more about him if possiable if you can point me in the right direction. My great grandfather, David Duguid was in Co. K, 129th Indiana Infantry. He moved to Southern Illinois after the war and died in 1919. He is buried in Oakdale, IL. Paul- I am a Duguid descendant from Jane Duguid and Robert McNaughton. There was also another David Duguid and Moses Duguid who served on the Union side of the civil war. Their father was Adam Duguid. The 2 David’s and Moses would have been 1st cousins. We have verified that your great grandfather and Moses both served in the 129th Indiana Infantry, Co. K. We are still trying to find Moses’s brother David and where he would have served. We do know that Moses died of acute Dysentry with Sherman’s March to the Sea. David, the son of Adam Duguid Died in 1862 of typhoid fever. He is buried in his home town of Ray, IN. I have not been able to find out which unit he was in. It could have been an Indiana or Michigan regiment since they lived on the state line. I have seen the name Duguid spelled differently in some records. My grandfather’s oldest brother, Henry D Garrison, was killed at Franklin along with one of his cousins, John W Garrison. A younger brother Thomas J Garrison was also believed to be there along with several other Garrison family members. My great-grandfather, NW Garrison Sr, would have been there, but was furloughed a few months prior due to illness. They fought in Company B of the 16th SC Regiment commanded by States Rights Gist. The 16th was originally made up of recruits from Greenville County South Carolina. I’m not certain if those killed at Franklin were buried there or were brought back to Greenville SC. Mr./Ms. Galloway? As a long time researcher on the Confederate Soldiers killed at Franklin I have reviewed my research for information on your brave ancestors. Cpl. Henry D. Garrison, age 20, of Co. B. 16th South Carolina was killed at Franklin. He is not listed among the known dead buried in the McGavock Confederate Cemetery. Also of Co. B. 16th South Carolina was Pvt. John W. Garrison, age 20, killed at Franklin. Both of these brave men are believed to be among the 565 Unknowns buried in the McGavock Confederate Cemetery at Franklin. Co. B. lost (9) men killed. The 16th South Carolina lost the most of any of the (4) South Carolina Regiments at Franklin, (65) killed or mortally wounded. Of these (65), (30) are known to be buried in the cemetery, (29) are believed to buried as Unknowns, and (6) are Distant Burials (died from wounds received here but buried at a different location). Mr Burgess, many thanks for the information. My apologies for the delay in responding, but I haven’t been accessing this discussion board very frequently. In my earlier post, I neglected to mention that another cousin of Henry and John W Garrison was KIA there as well. He was John A Garrison. Based on your information, it appears likely they were buried as unknown soldiers in the area. My best regards, Richard Galloway. I have identified 15 ancestors in the Battle of Franklin including 2 great-great-grandfathers. Of all these only one died, George L. Taylor who was listed in the surgeon’s list at Carnton and is buried in an unmarked grave there. John Mitchell Hasting, Co F 4th MS Infantry and John S. Nail MS Partison Rangers (with N.B. Forest) were my great-greatgrandfathers. GGGrandfather, Erastus Denman Branson, Private, Company A, 57th Indiana Infantry. Drafted, Mustered in at Terra Haute, Indiana and sent to meet the 57th in the field. Arrived in Tennessee the day before the the engagement at Spring Hill. He was captured at the battle of “Franklin”, was sent to Andersonville CSA Prison and died there 6February 1865 of pneumonia. Gideon George Garner, Co. H 43rd Mississippi, Adams Brigade, Loring’s Division, Stewart’s Corps. John Robert Whitesides, Co. C 10th Mississippi, Sharp’s Brigade, Johnson’s Division, Lee’s Corps. From what I know for certain, even though I’m only 19, my maternal great great grandfather on her father’s side of the family was at Franklin. Pvt Samuel Hufstedler of the 25th Arkansas, Reynolds Brigade. At least two relatives, both in the 57th Indiana Infantry, Co. I (Lane’s). One missing or KIA (John Beatty) second captured (Daniel Norris) sent to Andersonville. Upon exchange was sent to Camp Fisk, Ms. then boarded the Sultana. I am always looking for info on the 4th Corps and 57th Ind. My great-grandfather Abner Warner Graham fought at the Battle of Franklin while serving in Company A, 50th Regiment, Ohio Volunteer Infantry. The letter from Willis Hansford to his mother got my attention. Willis was a brother to my Great Grandfather. As such Thomas ‘Pap’ Hansford mentioned as being wounded was my GGGF. My family still lives in the same general location as when the battle of Franklin was fought. Wilson Blain Logan, 175th Ohio Volunteer Infantry, killed at the Battle of Franklin, November 30, 1864. He was my Gr Gr Grandfather. Left a widow and 4 children between the ages of 2 and 10. My great-great grandfather was Lt Col Daniel McCoy, who led the 175th Ohio Volunteer Infantry. There is a newly published book called “Baptism of Fire” which focuses on the importance of the 175th Ohio, the 44th Missouri, and the 183rd Ohio in the battle of Franklin. You should check it out. Jan…I am in the process of reading that book now. I heard a presentation by the author, Eric Jacobson, at the Nashville Civil War Round Table last month that was fasinating!! Samuel Miner Trulock (72ndRegiment of the Illinois Infantry) was my Great Great Grandfather – he lost his life in the battle at Franklin (Nov 30,1864). He was an attorney and left his widow Elizabeth Stark Trulock and ten children. His 2nd to the youngest daughter, Elizabeth Matilda married David Henry Fisk, who are my Great Grandparents. My Grandfather was their son, Carl Bismark Fisk. Toliver Taylor was in 1st State Troupers Co C. His Capt. B. F. Duncan and Col . Ellison Capers. He was definately my gr gr grandfather. And I would like to be included in any decendent things Thank you Sallie Hood. My great, great, great uncle was Mark Perrin Lowrey. Promoted brigadier general in Oct. 1863 under Cleburne. Started in the 32nd. Mississippi guards My great, great grandfather, James Perrin Lowrey, was Mark’s nephew. I remember him when I was a small boy General Lowery was also an ordained babtist minister with a congregation in N. Mississippi. He survived the war (I find it amazing that he did, seeing action at Shilo, Perryville, Chickamauga, Missionary Ridge, and the Atlanta campains), and founded Blue Mountain College for Women in Mississippi. My gggrandfather, Henry Yarbrough and his brother-in-law, Robert A Croxton, both fought in the battle of Franklin for the 17th Alabama. Robert was mortally wounded and is supposed to be buried there. The book I have on the history of the 17th Alabama says that Henry stayed behind on burial detail. I know I read about this battle in U.S. History, but after reading it now knowing I had a family member die there, really makes it surreal. I cannot imagine what these few hours were like on that day or the aftermath that followed. I am interested in any information or pictures of graves in the Alabama section. Thanks for a wonderful website and tribute to these men. Susan: Lt. Robert Allen Croxton, Col. F. 17th Alabama Infantry killed at Franklin and buried in Section 69, Grave 26 of the Alabama Section, McGavock Confederate Cemetery in Franklin, Tn. Susan, it looks like your decendant is buried next to mine! (Francis Eddins) I have some pictures my mother took when she visited the area 2 years ago, I also have a few books that go into a lot of detail about the McGavock site. There are not many from the 17th buried here, only 6 or 7 I think. My mother has lived in TN for almost 12 years now (about 30 minutes from Franklin) and we never knew about Francis until about 2 years ago. George Schuch of the 183rd Ohio Volunteer Infantry Co E was at Franklin. He was my Great Great Grandfather and survived the war. Keith, do you have any surviving personal items from George? Letters? Diary? Images? Anything? I found him listed as George Schuck in some records. Company E. Mustered in 10/16/64. His first action his unit would’ve seen was the Spring Hill/Franklin engagement in late November. The 183rd also fought at Nashville. Most of the 183rd seems to have been mustered out at Salisbury, NC. Revillow Newton Spohn was a Corp. for Co. K of the 183rd OH Inf. and was at the Battle of Franklin. 99% certain killed at Franklin. Co. E, 29th Mississippi was in BG William F. Brantley’s Brigade of MG Edward Johnson’s Division, LTG Stephen D. Lee’s Corps at Battle of Franklin. John Bell Hood’s Army of Tennessee. He was present for the battle, and never returned home, Company “E” was “virtually” wiped out according to records. 2. PVT Leftrick Reynolds Powell, Company “F” Eleventh Tennessee Inf. Regiment was either killed at Franklin or mortally wounded. Is buried in an unmarked grave near Cedar Hill between Nashville and Adams, TN. My GG grandfather, John Glen Neal (went by Glen) was killed Dec. 1, 1864 in Franklin….like so many others. He was in the Mississippi Vols in the 43rd regiment, company D, and he enlisted on 4/25/1862. He was a farmer and left 7? children at home. My mother said when he was killed, his wife, Leanna Hill Moore Neal worked their children to death to keep the family farm..which they did. She never did marry again. Glen came from Bellefontaine, Webster County, Ms. and he was a private. Hi do you have any information on Daniel W. Melton? Dates/place of birth, wife, children, etc. We have a Daniel W. Melton in our line but cannot not find any information after the start of the civil war. Thanks. Sgt. Joshua Denton Phillips, 16th TN, Company A, Cheatham’s Corps, Brown’s Division from Smithville, Dekalb County, TN. He was a sharp shooter with a Whitworth rifle that he had won at winter quarters near Murfreesboro in 1862. My G/G Grandfather John Alexander Brogden Pvt. 16th Tn Inf. CSA somehow survived the battle. Claiborne Brogden 27th Alabama Inf. a distant relative. My 3rd great grandfather, 2nd Lieut. Robert Benjamin Hendricks, Co. K, 46th TN Infantry was wounded 30 Nov 1864 and died 2 days later on 2 Dec 1864. He is buried in the TN Section of the McGavock Cemetery. I have a photo of him in his Civil War Uniform. Also his brother William D. Hendricks – Sergt, Co K 5th TN Infantry was wounded at the Battle of Franklin with a bullet through his eye, he survived and later married, but never had any children. My Grandfather’s dad (my Great grandfather) – sounds closer doesn’t it? Was Ernest Wernick, and fought there as a member of the 75th Illinois Infantry. Survived the war and died in 1919 in Dixon, Illinois. Great-great-great Uncle J.K.Bivins fought under Granbury at the Battle of Franklin and lived to tell of it. My great-grandfather on my mother’s side fought at the Battle of Franklin. His name was Pvt Robert Patten, 4th. Mississippi Infantry, Company E of Sears Brigade (Claudius W. Sears), General Sam French’s Division, A.P. Stewart’s Corp. He served with them since Fort Donelson all the way to the bitter end. Don’t know how he survived, he musta been a good ducker. He was captured at Fort Donelson and again at Vicksburg. He also served for 10 months on a gunboat on the Yazoo River. Would you be willing to sell me a copy of the diary. I would use it as research for a regimental history I’m completeing of the 63 IVI? Cpl. John Marshall Eakin fought with the 46th Mississippi infantry / Sears brigade / French’s division was among the first wave and pinned down at the inner earthworks until the Federals pulled out. He survived the battle and went on with the rest of the war. I have no doubt he never forgot that day. my husband,s GGGrandfather was John Glen Neal. Private John Glen Neal — missing after Corinth; captured Vicksburg; wounded Franklin, TN (thigh); died next day . He was a member of The 43rd Regiment, Mississippi Infantry Volunteers, CSA, was also known as Moore’s Regiment, Harrison’s Regiment, the Camel Regiment, and the Bloody Forty-third. The 43rd Regiment was Organized 15 May 1862. My husband’s ggg-grandfather, Richard Albert Barry Craig was with the MS 22nd Company H, in Featherston’s brigade; was taken prisoner; Chicago in the winter of ’64 until the end of the war in April ’65. His g-grandparents Andrew and Kate Barry were heroes in the Battle of Cowpens, SC in the Revolution. First time to this site. My ggg-grandfather is Winfield Scott Featherston. Looking for family info. My Great- Great Grandfather was John Davis the man in the photo. I have always wanted a picture of him and now through your web site I can finally see him. Thank-You and may God Bless! I have two great grandfathers who fought at Franklin. My Great Grandfather Pvt. Henry August (H.A.) Workover Co. D 2nd Mo Vol. Inf was wounded and taken as a POW at the Battle of Franklin. He and his brother Willam Workover joined on Jan 12, 1862. William was killed at the Battle of Corinth, Miss (Oct 4,1862). How do I go about finding out more? James Peter Barmore, Private, Company “H”, 12th Louisiana (Scott’s Brigade), somehow survived this battle and the War, giving my family an opportunity to exist. It’s awesome to consider that nearly every American, other than the most recent immigrants, are somehow or another the direct result of the Civil War, which impacted every man, woman, and child then living. If not for it, an entirely different people would populate this land. John Leander Bagwell, Private, Company “I”, 15th Mississippi. He joined the “Choctaw Guards” with 5 of his brothers. John survived the Franklin battle only to be captured later during the battle of Nashville. He spent the remainder of the war as a POW in Camp Chase. John, along with six of his brothers, served in the Confederate Army during the Civil War. John was a private in Company I, 15th MS Infantry, “Choctaw Guards/Rangers”, R.G. Prewitt Company, and enlisted May 1862 at Black’s Wells, Choctaw Cty. John was in battles at Vicksburg, Peach Tree Creek, Atlanta, Nashville, and Franklin, TN. He was wounded in Franklin in 1864, captured in Nashville and taken prisoner and retained for six months at Camp Douglas, Illinois, from which he was paroled on June 17, 1865. Camp Douglas, on the shore of Lake Michigan at Chicago, flooded each time it rained. It was a miserable place and many prisoners died there. His brother Henry B. was killed in action about 1865. My great,great,great grandfather James Mills, Private, Co. A 23rd Mississippi, fought at Franklin and was captured at Nashville, while covering the Confederate retreat from Nashville. He survived the war, but I never knew whether or not he was sent to a northern prison like so many others from this battle. Any ideas on how I might find out? William Jasper Killion and his cousin Aaron Leonard Killion were both in the exposed skirmish line in front of the main Federal entrenchments at the second Battle of Franklin, TN. They were captured and taken to the Confederate prison known as Andersonville in Georgia. He survived the war by only three years, though it took several years of petitioning for his widow and children to receive any sort of pension by proving that his death was connected to his military service (he was never in good health again after being incarcerated at Andersonville; though he arrived there after the severe overcrowding had been ameliorated, there was still a serious lack of food, clothing, shelter and medical attention). My husband and his sibilings, my children and their cousins and my mother-in-law are the descendants of Jasper Killion. Somehow I missed a notification from WordPress, when you submitted your ancestor’s information. Always interested in sharing any information about the men who served along side of my G.G.Grandfather. He was also with the 57th Indiana Infantry, Co. A, captured at Franklin and sent to Andersonville, where he died 6 Feb. 1865. Really would like to hear if your ancestor shared any of his experiences after his capture, or during his time at Andersonville. I am Aaron Killion’s great-great-great grandson. Adam Killion. Would love any photos you might have of them. I am a direct descendent of Josiah Hodson, Private(?) in Indiana 84th, Company K. We’ve been told he never talked about it but he supposedly was the only man left standing in his company after this battle. We have nothing to substantiate that statement and request as much info as possible about him and his outfit. My great-grandfather Warren H. Fishel was a private in Co. “B” of the 125th Ohio Volunteer Infantry Regiment. He volunteered at age 16 in the fall of 1862 and survived Chickamauga, the Atlanta Campaign, Spring Hill, Franklin and Nashville and mustered out in one piece in May of 1865. His father Samuel served in the 41st OVI (volunteered at age 47) fought at Shiloh and Stone’s River leaving the army after being seriously wounded there. His oldest son Ebeneezer Fishel fought at Perryville with the woefully trained 105th OVI, was captured and paroled there; died of disease in Louisville in May of 1863. Samuels’ second oldest son, Wesley C. Fishel, fought with Warren in the 125th OVI until seriously wounded at Kennesaw Mt. Above you will see a posting by my relative Chuck McDowell, dated April 16, 2010. I am related to the McDowell’s through my grandmother Mary Elizabeth (Eagan) Fishel. She is a descendant of Rachel (probably Cathey) McDowell. My sympathies and admiration are for men of Blue and Gray who fought so bravely through our country’s most difficult trial! I believe my GG Grand Uncle, Jerome Grable, fought at the Battle of Franklin. He was a private in the 104th Ohio Volunteer Infantry. He mustered in his unit in Aug 1862, and mustered out in June 1865, His unit was in the very front near the Cotton Gin. Since discovering my GG Granduncle I’ve been studying the Battle of Franklin. I’m very thankful for the information provided on this site and for the chance to mention Jerome here. The terrible sacrifice made by the soldiers at Franklin are not to be forgotten. All the Grables that were of age during the Rebellion served in the Union Army in various Ohio units. My gggrandfather fought at Franklin: Benjamin Newman was a Private in the 88th Illinois (“G” Company), Opdyke’s Brigade. He survived the war, made Sergeant just before the Rg’t was disbanded and passed away in 1901. His actual discharge, which has a handwritten inscription listing all the places he was in action (including Spring Hill, Franklin and Nashville), is framed in a place of honor in my office. Mike, Did you ever see the Confederate flag (staff) your G-grandfather captured during the battle? It was on load for a while at the Carter House visitor center. It was on LOAN…not load! Sorry! Mike, Actually, it was Benjamin that captured the flag from an Arkansas brigade. After the battle, soldiers were required to turn in their trophies to regimental headquarters, then in turn to division headquarters, All captured momentos from the battle of Franklin were displayed in Nashville at some point for General George Thomas. Afterwords, the flag and staff were sent home by Newman. The flagstaff had been shortened, apparently from being shattered by bullets during the battle. What sparked my interest is that I own the flag staff which has the original stenciling depicting his name and the two regiments who were carrying the flag. I purchased it many years ago from an auction house in Kentucky I believe. Lewis, both fought in the battle of Franklin. they were in Company H in the 46th Alabama Regiment. Direct descendant of Asa Minor Laney killed at the Battle of Franklin. Supposedly 1st Confederate identified and buried at the private cemetery. Direct descendant of Asa Minor Laney. Buried in the Mississippi section. Would love to hear from others. Carol Lee Smith My great-grand uncle, Samuel Miner Trulock, fought and died at the Battle of Franklin in TN.. He was in Co. I 72nd Inf Reg. He died on December 11, 1864..
My great-great grandfather, Wesley Smith Dorris fought and died at Franklin. He served with the Tennessee 30th Infantry, Company k. A portrait of Wesley hangs in the Carter House museum. In the cemetery he is thought to be buried with the Missouri troops and appears at WSD. An additional highlight for my family is when my daughter, Annie Dillard Cole was married in the garden at Carnton in 2007. I am descended from William Lewis, Co. I, 64th OHVI. He was wounded at Spring Hill, and is said to have died in the regimental hospital Nov 29. Any idea where that hospital was and where he might be buried? Today I discovered that Reuben H Shotwell of the 35th Mississippi had a daughter who married Selwyn C Edgar of St Louis. His Mother Mary Edgar was the wife of Timothy Bloomfield Edgar a famous businessman of St Louis. He was a friend and neighbor of John Freemont the explorer. Also Selwyn C Edgar had a patent for a zinc smelting plant. He was president of the Cherryvale Kansas zinc plant. Since Mary was the mother in law of Reuben H Shotwells daughter, I guess that kind of makes him kin? I love the Civil War History. I have written another take on Gettysburg where the south wins. I may have a chance at having a famous print artist allow me to use one of his prints for the cover of the story which I hope to publish. William C. Crozier, captain with the 12th Kentucky, was my great-great uncle by marriage. His son, Hugh Crozier, would take me as a boy across the battlefield of Perryville and tell me stories of his father’s service. William’s brother, James Crozier, fought for the Confederates. They tried to find each other after the Perryville battle. Today, I walked across the ground between the Carter House and the Cotton Gin, where the 12th Kentucky was brought up to staunch the line. William Crozier was an acquaintance of Arthur MacArthur, father of Douglas and recipient of the Medal of Honor at Franklin. Levi B Bays Private with 72nd Illinois Infantry Company “I” was my GG Grandfather. I do have his discharge paper and the battles in fought in. I will attempt to sort at the info on his discharge report and list his battles. My ancestor who fought and was killed at Franklin was George W. Whitecotton, from Georgia. I have proven he was there in more ways than one, including a rare find in a book where a minister said he saw Lt. George Whitecotton take a wound in the head. I guess his wife and children never asked for his remains and left them in Franklin, as he is not in the cemetery with them in Georgia. Peggy could you send me your email address. I am adding a small note about your ancestor and met a gentleman who is a descendant at the reunion a few years ago. My direct ancestor Wilburn Phillips and many other relatives were also in the 37th Georgia but a different company than George. Thanks! My great grandfather was Col. Turpin Dickson Magee. His daughter, Ella Dickson Magee,was my grandmother. She married William Jackson Hubbard from Mississippi. Ella Magee and William Jackson had seven children. Their sixth child was my father Dr. Roscoe Conkling Hubbard. In February, 1862, T. D, Magee raised Company B, the Covington Rebels in and around Williamsburg, MS. He remained Captain when his company became a part of the 46th Mississippi Infantry Regiment.. He was later promoted to the rank of Major. When Colonel William H. Clark was killed in Atlanta, Major Magee was promoted to Command of the Regiment leading it through the Battle of Franklin. He was wounded at Franklin. I was named Margaret after my great grandmother, T. D.’s mother. My twin sister was named after his wife Caroline. United States Army, 1st Sargent Christian Shanks: My mother and her twin were born 1922 and she remembers well her grandfather who passed on in 1928, He served as 1st Sargent, in the 8th Tennessee, Company H. He was from Hawkins county, eastern Tennessee and had several 1st cousins who were confederates. Indeed a war within and between families! Further, another interesting point of interest: I have proof that his captain had deserted the Franklin battlefield while in action. Later in North Carolina, right after Johnston surrendered, my grandfather’s captain was court marshaled and forbidden to ever be employed or hold a position of trust in the United States government. To complete his sentence it was ordered to have his offenses published in the camp newspaper, his hometown newspaper, and all local newspapers whenever he changed his residence. Dan Klinger GR,GR Grandfather John Klinger his brother from my dads side John Grothouse GR,GR uncle from my moms side all in co F 118th OVI from Delphos Ohio. Would like to converse with anyone interested in this unit. Great great grandfather Robert S.Dooley. Jesse James Durham was the only son among five daughters. He was a Confederate soldier in the 20th Tennessee Infantry. He had fought at Atlanta and at Chattanooga. Then his unit moved up toward Nashville and fought in the Battle of Franklin on 30 November, 1864. He was killed that day as was his best friend, Pete Morris, also from Cheatham County. Jesse had a leg injury and bled to death. The families traveled to Franklin and brought the boys back to Cheatham County. They were buried together in a Morris Cemetery. Today, the family still has a letter Jesse wrote while his unit was at Mobile, AL. A copy of the letter is on file in the Tennessee State Archives in Nashville. My maternal GGG Uncle, Samuel L England, from the Missouri 3rd Infantry Regiment, Company H, died at the Battle of Franklin and is buried at McGavock Cemetery in Franklin TN. His grave was originally listed as Unknown 55, but is now attributed to Samuel England. I’d like to know how it was retroactively identified. I suggest you contact Eric Jacobson through the Battle of Franklin website. He may be able to answer your question or know someone who can. Another contact would be Thomas Cartwright with the Lotz House Museum; they have a website too. John M. Norwood was a private in the 43rd. Mississippi and fought at the Battle of Franklin. He was under Gen. John Adams and survived the war. He was my gggrandfather. Doy Tucker Woodstock GA.
Had 3 Dan and John Klinger and John Grothouse all in co F 118th OVI Moore’s brigade Rugers Div 2323rd Army Corp have 4 diaries 350 letters 60 photo’hope to have a book out in a year or two retire in 8 months. Gordon, my Great Grandfather David Duguid and his cousin Moses Duguid were also in the 129th Indiana, Company K. They were from the small town of Ray, IN on the Michigan border. My husband’s great-great grandfather on his mother’s side of the family was 1st Lieutenant Daniel M. Stearns of the104th Ohio Volunteer Infantry. He was also the owner of Harvey, a dog that was one of the mascots of the 104th OVI. Daniel Stearns and Harvey made it back home to Berea, Ohio after the war. Daniel was never the same after his war experience and quite possibly suffered from PTSD. He did go on to marry and had three children. Susan… Harvey is quite well known!! My Great Grandfather was Arthur Burbick. He & his brother, Thomas enlisted in Company F of the 104th OVI out of Columbiana County, Ohio in August of 1862. I believe Company F had the dog Harvey. If so, they must have served with your husband’s relatives! Private, George C. Chesser, 53rd Tennessee, Company G.
Died October 28, 1903 in Savoy, Fannin County, Texas. Captured at Fort Donelson in 1862, sent to prisoner of war camp at Camp Morton, Indiana. Paroled, rejoined his unit and went right back to fighting. George is my g-g-grandfather. We know very little about him. My other g-g-grandfather, Private William Henry Staples fought with the Union, the 114th Illinois Infantry. Ironically, both g-g-grandfathers faced off at Vicksburg in opposing armies. William was captured performing rear-guard action to cover the Union retreat at Brice’s Cross by General Nathan Bedford Forrest’s calvary and was sent to a prisoner of war camp, possibly Andersonville. A photo of William in his uniform was found in the Abraham Lincoln Presidential Library. The William Staples family had moved west to Sangamon County, Illinois from Kentucky. Abraham Lincoln also lived in Sangamon County, and also originally from Kentucky. My G-G grandfather was Eli Holsapple, co. I 10th ind. cavalry. He fought at Nashville,Franklin and West Harpeth along with his brother William and his cousin Andrew Jackson Holsapple as part of Wilsons cavalry corp. Very interested in info on Eli,William and A.J.Holsapple and 10th ind, cavalry. Thank You!